This is "generally considered to be the first" economic thematic map ever produced, using "a variety of symbols to show the occurrence of fifty-six commodities, along with others to show cities, ports" and other commercially important features. Robinson 1982, 55. The map is dense with the symbols of the 56 various products and activities: gold, silver, tin, copper, iron, etc. Each symbol is shown in a key below the map, and summaries are set out in the margins separately for each of the 26 countries. A system of underlining shows whether each product is consumed at home, processed for domestic consumption or export, or exported directly. 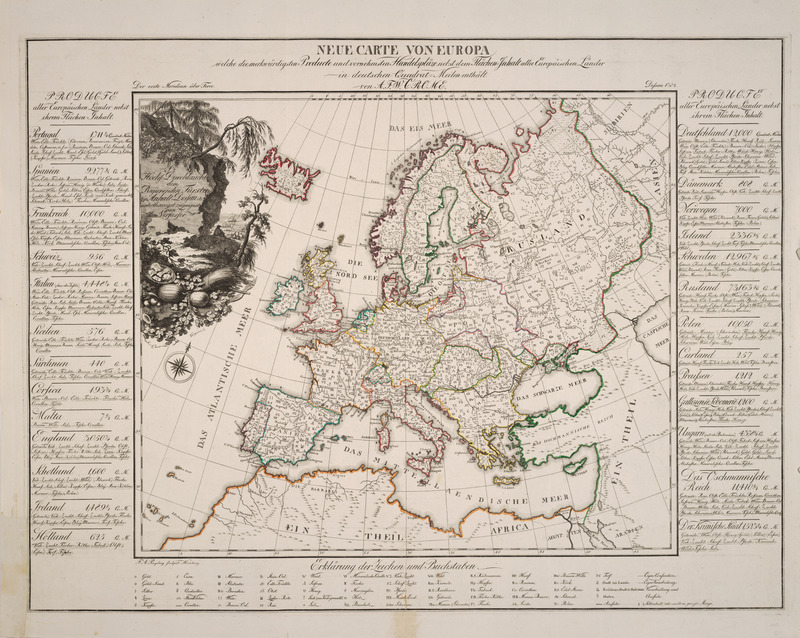 Crome was teaching geography and history at Dessau when he published this map at age 29. It provided him with early scholarly and financial success, and he became a professor of statistics and political economy at Giessen. Ibid.